Brown-Forman Corporation engages in the manufacture, bottling, import, export, and marketing of alcoholic beverage brands. This dividend aristocrat has increased distributions for the past 26 years. For the past decade this dividend growth stock has delivered annualized total returns of 10.80 % to its shareholders. The company has managed to deliver a 9.50% average annual increase in its EPS between 2000 and 2009. Analysts expect Brown-Forman to earn $3.10 per share in 2010 and $3.30/share in 2011. Over half of company’s sales are coming from international markets, which is one of the primary fuels of growth in earnings and revenues. A large chunk of company’s revenues are derived from its Jack Daniel’s Tennessee Whiskey line. This could be an issue if alcohol consumption shifts significantly to wine and beer. 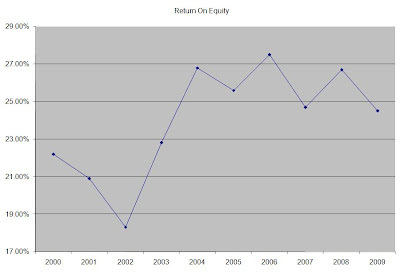 The Return on Equity has been rather stable after rising in the beginning of the decade. Rather than focus on absolute values for this indicator, I generally want to see at least a stable return on equity over time. 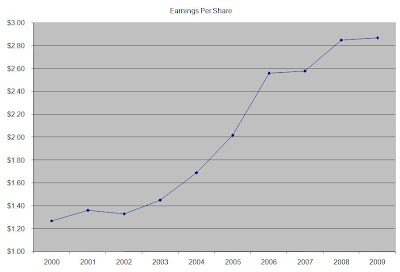 Annual dividends have increased by an average of 9.80% annually since 1999, which is in line with the growth in EPS. 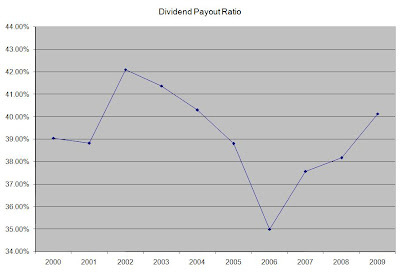 A 10 % growth in dividends translates into the dividend payment doubling every seven years. If we look at historical data, going as far back as 1985, Brown-Forman has actually managed to double its dividend payment every eight years on average. The company last raised its dividend in November 2009. The dividend payout ratio has remained mostly stable having never exceeded 50%. A lower payout is always a plus, since it leaves room for consistent dividend growth minimizing the impact of short-term fluctuations in earnings. Currently Brown-Forman is attractively valued at 17 times earnings and has an adequately covered distribution. The main issue with this dividend investment is that it yields only 2.30%. I would consider initiating a position in Brown-Forman on dips below $40.